We are happy to serve residential customers for their pool needs in Collier County and some parts of Lee County into Bonita Springs and Estero. Our clients typically choose the weekly or monthly package. The weekly package is for the folks who really want a hands off pool experience and would like it to just be ready to go any time they want to go for a dip. Our monthly package is for customers who don’t mind the day to day skimming and scrubbing, but would like a professional company to come in and do a deep scrub, test the chemical balance of the water (adding more chemicals and shocking the pool if necessary) and in particular run maintenance checks on all the pool equipment. Both of these packages will give our residential pool cleaning client peace of mind that their aquatic oasis is in tip-top-shape! Typically, here in southwest Florida, most residential homes have concrete pools. Two other options that are occasionally seen are fiber glass and vinyl liner pools. We can maintain all three types and provide some equipment repairs on these types as well. Concrete is very porous and provides perfect places for algae to attach and grow. This is why it is very important to regularly maintain your concrete pool. It is recommended to scrub the concrete lining roughly once per week to scrape off any growing gunk. Fiber glass pools are a little easier to maintain. The lining is much more smooth and doesn’t give such a stronghold to algae. That being said, it is still important to brush the sides and treat with chemicals. Especially in the area we live because it is so humid and is a breeding ground for slime and sludge. Your spa is just as important as your pool. Some might argue that it’s more important! We know this is your Zen space and we treat the spa just like we would the big pool with proper scrub downs, vacuuming, chemical treatment, and water testing. 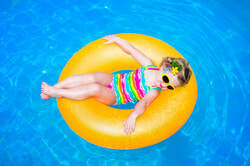 We recommend to circulate your water often to transfer water and chemicals from the pool to the spa and back again. No need to be worried about children or pets. You will have a schedule of exactly when we are coming and you’ll know if we are adding any chemicals or shocking the pool. We advise no one enter the pool for a dip or swim for a few hours after the treatment. Often giving it until the next day is a safe bet. We prefer to manage our client expectations by having a transparency with our service. We strive to go above and beyond for our customers and do those little extra things the residents will love us for! We provide precise schedules and copies of our cleaning and maintenance checklists. We insist on customer feedback so we can rate how we are doing. Our phones are always open if you need to swap upkeep days or simply have a question. ​Need commercial pool cleaning? We provide that too!